Sadly, all good things must come to an end. Maw-Maw and Paw-Paw are headed home. It's smart really, they are leaving right before we get temperatures in the 90s. For those of you who aren't familiar with our particular brand of heat in central Illinois, that is 90 some odd degrees with about a million percent humidity. We'll need machetes to cut through it. But such is life around here. We have the joy of biting cold in the winter and sweltering heat during the summer with about a day of spring and fall in between. I really do love it here for the most part, but a good solid month of high sixties and low seventies a couple of times a year would be nice! We actually have a batch of these sourdough banana bread muffins in the freezer right now. They have that perfect banana bread flavor and texture with the convenience of a grab and go muffin. Jax has been loving getting one in the morning and heating it up for a few seconds in the microwave. A quick schmear of butter and breakfast is ready. He loves to eat his muffin, drink his milk and cuddle with his mommy for a few minutes before he goes to daycare. He is the cutest thing, in case you didn't know. Preheat oven to 400 and grease muffin tins. Stir together sugar, egg, bananas and sourdough starter. In a separate bowl, mix together dry ingredient. Then add dry ingredients to wet ingredients, stirring until just mixed. Stir in coconut oil and vanilla. Scoop into prepared muffin tins. Bake 12-18 minutes, or until a toothpick tests clean. Remove from muffin tins and cool on a wire rack. Absolutely loved the slideshow of maw maw and paw paw's visit! Looks like you guys did so many fun things and that heart cake is precious! And talk about yummy.... sourdough and banana in the same recipe, oh yeah! It was an action packed visit for sure! We had a lot of fun. 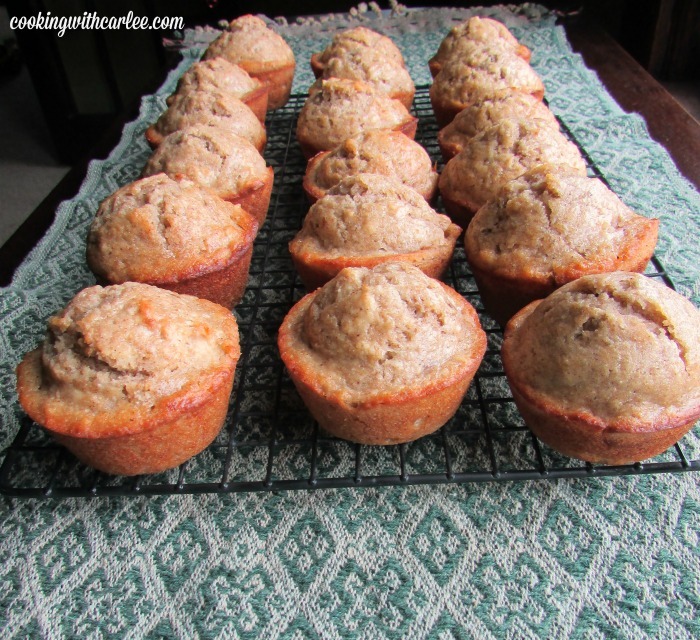 Jax has been loving these muffins and they are a great way to use some starter when it needs refreshed. You may have exaggerated the weather around here just a little bit. We get at least two nice days in the spring and fall :-) We sure did have a good time with MawMaw and PawPaw. Sometimes we get two nice days... sometimes. I want a whole string of them in a row where you don't need air conditioning or the heater. Is that too much to ask?! We did have a lot of fun crammed into a few short days, that is for sure! Just baked a batch. They are great! Any chance you will come up with a banana nut oatmeal muffin? How about a peanut butter and jelly one? I love your sourdough muffin recipes. I doubt the nut one will happen as I am the only one here that eats them! But I already have another sourdough banana muffin recipe to post. It uses applesauce too. I have an idea I can't wait to try as soon as these are gone! What a great recipe Carlee - it's perfect to keep a starter going, too! I feel the same way about our weather, I swear!! I hate throwing away starter when I feed it, so I love quick recipes like this where I can use it instead! I love trying new recipes using my starter too! These muffins are really good and I have a few on here that use oatmeal and starter that are super amazing also! Hi Carlee!! These look so good, I didn't make them yet, but did pick them as one of my additional features at You Link it, We Make It tomorrow! Hope to see you back for the party! Thank you! They are a great way to use some starter and Jax has been loving getting one out of the freezer each morning! We will really enjoy the combination of your muffins. Thanks so much for sharing with Full Plate Thursday and come back to see us real soon! Thanks Miz Helen, we have certainly been enjoying them! I could go for an entire summer of 70 degrees! What a treat that would be! These muffins sound fabulous. I really must try these. Doesn't a stretch of 70s sound great? Especially as it is in the mid-90s here today and humid as all get-out! 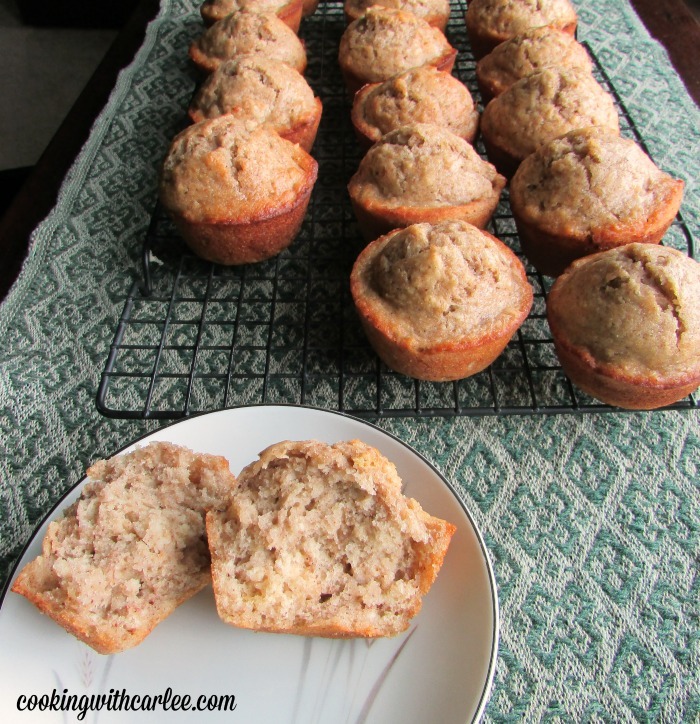 I have never heard of making banana bread muffins with sourdough. Sounds very tasty! Thanks for sharing. It is delicious! I have been really into making sourdough muffins lately. I like to use a lot of whole wheat flour in my baked goods and I feel like the sourdough helps keep them from feeling too dense and gives them that extra boost. Thanks for the recipe! My hubby made them and they loved them. I'm allergic to bananas �� But they smelled amazing! I am making them for family friends next-that's when you really know it's a great recipe!